In May, just before one of the hottest summers on record, the U.S. Centers for Disease Control and Prevention issued a warning about diseases lurking in recreational water facilities such as swimming pools. 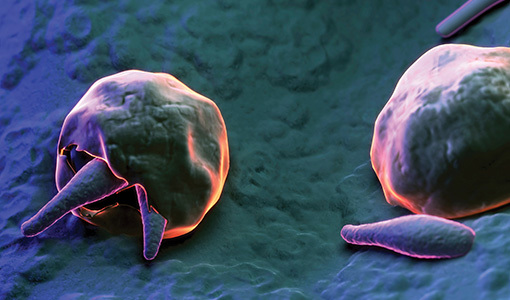 In nine out of ten cases in which an infectious cause was identified, the culprit was the microscopic parasite Cryptosporidium. Crypto, which commonly refers to both the parasite and the diarrheal disease it causes, cryptosporidiosis, infects humans and animals. It is a serious problem in developing countries, where it is a leading cause of life-threatening diarrhea in children under two. Swallowing one mouthful of crypto-contaminated water can cause illness, and cases reported in the U.S. are increasing. While most people recover after a few weeks of significant gastrointestinal upset, young children, the elderly, and the immunosuppressed can face chronic infection, wasting, cognitive impairment, and even death. No vaccine exists, and the sole FDA-approved drug for crypto is, paradoxically, ineffective in people with weakened immune systems. To produce oocysts for scientific investigation, crypto must therefore be grown in host animals, an expensive, time-consuming, and cumbersome process. “To evaluate and optimize prototype vaccines and test them in humans we need to use the same source, age, viability, quality, and quantity of oocysts. This is impossible with available methods, which necessarily involve variation,” said Tzipori, who is also the Agnes Varis Chair in Science and Society and chair of the Department of Infectious Disease and Global Health. Now, Tzipori and his team, in collaboration with researchers at Massachusetts General Hospital, have developed a way to rapidly freeze crypto oocysts and thaw them as needed for study. Their work was supported by the Bill & Melinda Gates Foundation and recently published in Nature Communications. For the past forty years, scientists have tried to keep crypto oocysts for later use by slowly freezing them, “but those methods didn’t yield infectious oocysts,” explained the paper’s co-first author, Justyna Jaskiewicz, a veterinarian pursuing a Ph.D. in biomedical sciences in Tzipori’s lab. The group discovered that the oocysts’ impermeable walls kept out cryoprotective agents and, as a result, sharp ice crystals formed and damaged the oocysts’ infectious interior. To help tackle this problem, Tzipori’s team tapped the expertise of Massachusetts General’s Center for Engineering in Medicine, whose co-founder, Mehmet Toner, is widely known for advances in low-temperature biology and tissue stabilization. The solution turned out to be bleaching the oocysts to make their walls permeable, then soaking them in protective chemical agents. Oocysts in solution were then loaded into cylindrical glass microcapillaries about three inches long and 200 microns in diameter—the width of about four human hairs—and plunged into liquid nitrogen at -196 degrees Celsius (about -320 Fahrenheit). Almost immediately, the oocyst solution morphed into a glasslike solid free of ice crystals. “Our technique vitrified the oocysts almost instantaneously,” said Rebecca Sandlin, an investigator at the Center for Engineering in Medicine and co-first author on the paper.